Congratulations to the 2018 PA-DE ASLA Professional Award Recipients! 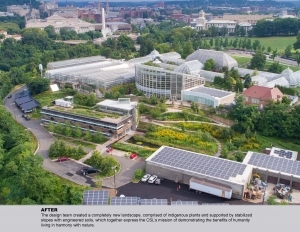 The Center for Sustainable Landscapes (CSL) at Phipps Conservatory and Botanical Gardens advances a new design paradigm where building and landscape systems are functionally interdependent. 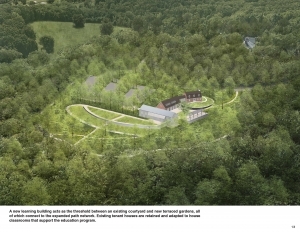 By sensitively orchestrating development within a steeply-sloped environment, this former brownfield site demonstrates restorative landscape strategies and net-positive water and energy, while remaining the world’s only project to attain LEED, SITES, Living Building Challenge, and WELL certifications. The CSL uniquely showcases these replicable design strategies for Phipps’ 330,000-plus annual visitors. Mt. Cuba Center (MCC) is a unique garden focused on showcasing and conserving the native plants and habitats of the Piedmont region. MCC recently expanded its general admission and merged with the Red Clay Reservation, increasing its acreage and Natural Lands. To integrate these significant transformations, MCC engaged a master planning team in a 18-month effort. The plan reinforces the garden’s mission to inspire conservation stewardship while providing a long-term vision for adaptation and growth. In 1980, Pittsburgh created the Greenways for Pittsburgh program to consolidate steeply sloped land to protect hillsides and preserve open space. Over 600 acres of greenway were created, but the program struggled with long-term stewardship. 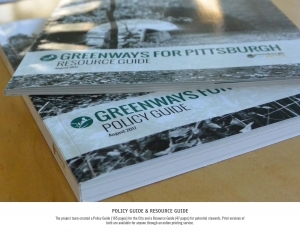 Greenways for Pittsburgh 2.0 reestablishes the program with new policies and resources. The Policy Guide assists City administrators in working with communities to build the Greenways system. The Resource Guide and Community Engagement Toolkit empower communities to take action. Nestled within 80 acres of rolling topography, woodlands, meadows, and wetlands, Grace Farms effortlessly blends architecture with nature, crafting a space deeply valued by its community. The design underscores the value of ecological stewardship and land preservation and strengthens the connection between people and nature that enhances habitat vitality and the human experience. 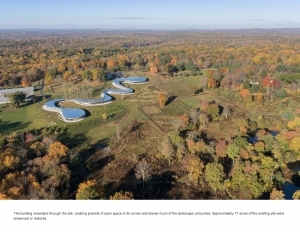 Today, the site provides a respite for visitors of all ages, striking a balance between architectural aspiration and thoughtful landscape design. For decades, Dilworth Park was a maze of raised and sunken terraces, hidden stairways, and dark corners. 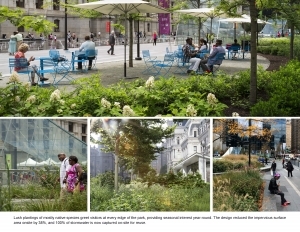 By restoring the plaza to street level, the design team has provided universal access to a revitalized park with transit gateways, a dynamic scrim fountain, a café, new vegetation, and a lawn, all above a continuously active subway nexus, creating a contemporary public space worthy of its prominent location at the foot of Philadelphia’s City Hall. 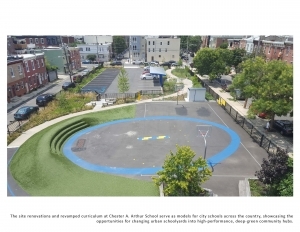 With the creation of a new outdoor learning environment, Chester Arthur School is redefining the traditional schoolyard model. Renovations to this urban public school concentrated on translating STEM curriculum for outdoor learning. A series of educational labs were developed to transform the asphalt schoolyard into a dynamic arena for studying habitat, systems, motion and energy. Students and community residents alike enjoy opportunities for hands-on learning in a greened landscape that manages stormwater and creates habitat. 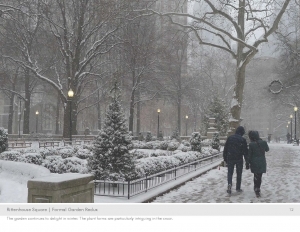 Merit Award: General Design - TEND landscape, inc.
Rittenhouse Square, a Philadelphia landmark, is considered one of the country’s most successful urban parks. Maintenance, public programming, and a committed Friends group are key to its endurance. In 2014, the Friends of Rittenhouse Square commissioned a new vision for the formal garden, the park’s horticultural centerpiece. 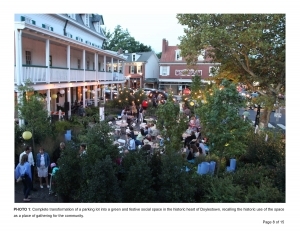 The designers worked closely with representatives from the Friends and Philadelphia Parks and Recreation on the design plans and maintenance guidelines for the garden, installed in 2016. The Bud and Susie Rogers Garden is a gift to the people of Akron. 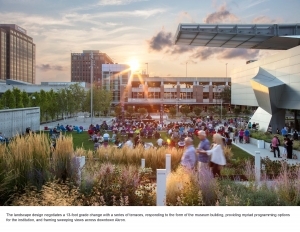 The garden replaces what was once a cracked asphalt surface parking lot with a flexible, accessible, and beautiful garden, a green jewel which elegantly merges the rich ecological vocabulary of Northeastern Ohio with the city’s proudly industrious heritage. It is a place of connection and civic pride, providing an experience unique to the region, where people mingle, relax, create, and celebrate. Merit Award: General Design - Klavon Design Associates, Inc. 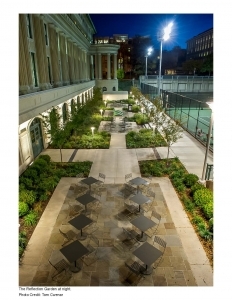 The Reflection Garden is an intimate gathering space that integrates green infrastructure to solve persistent flooding issues at the historic Margaret Morrison Hall on the campus of Carnegie Mellon University. On the surface the garden is a peaceful, natural amenity for student and faculty. Beneath the garden, a gravel bed and storage tank were installed to capture a 100-year storm. Since the Reflection Garden was completed, Margaret Morrison Hall has never flooded. Merit Award: General Design - Ground Reconsidered, Inc. The restoration of the Ann Bartram Carr Garden is significant because it is the first major garden restoration project at Bartram’s Garden in nearly a century. 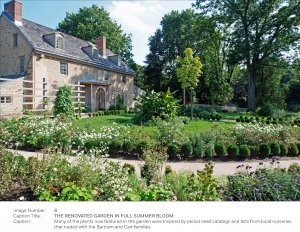 The restoration enhances the garden’s historical accuracy and beauty, reinterpreting it as it was during the period when Ann Bartram Carr (1779-1858) was in residence. Carr was an accomplished horticulturist and plant entrepreneur, and one of the first women to run a gardening business in our young nation. Merit Award: General Design - Lamba Associates, Inc. These temporary Pop Up Park installations represent creative and innovative design experiments that have helped overcome resistance against losing parking, and have changed public perceptions about green spaces as catalysts for social, economic and environmental benefits. These Pop Up Parks have attracted a following asking for its annual return, they were used as models for similar installations in other locations and communities, and they have started serious conversations about ways of making them permanent. 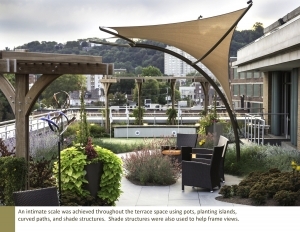 The project challenge was to design a green roof on an existing facility that: uses the proven therapeutic power of art and nature to help in the healing process; provides a positive distraction for patients before and during treatment as well as throughout the four seasons; accommodates the safety and unique needs of blood cancer patients; provides a variety of intimate, contemplative and social gathering spaces within a small terrace; and uses sustainable design principles. 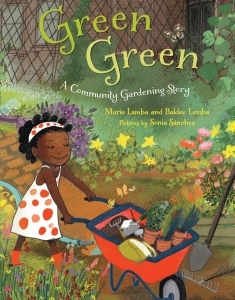 Merit Award: Communications - Lamba Associates, Inc.
GREEN GREEN: A COMMUNITY GARDENING STORY, a picture book featuring multicultural characters, celebrates how children can work together to turn a vacant urban lot green. The book also shares ways to improve our larger environment. Back matter promotes community gardening and shows how families can help save honey bees and Monarch butterflies, which are vital pollinators. This rhyming, colorful read-aloud book introduces young kids and their families to larger issues of sustainability and community building. 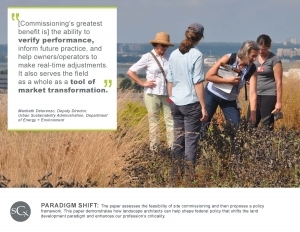 The Site Commissioning White Paper—published in 2017 by the U.S. General Services Administration (GSA)—establishes a progressive, policy framework for field-verifying landscape performance at a national scale. As the most comprehensive site commissioning research effort and publication to date, this landscape architect-authored study engaged policy-makers and working groups comprised of 89 industry thought-leaders. GSA’s forward-thinking adoption of site commissioning policy has the potential to prove the value of landscapes, while revolutionizing the design/construction/management industries.